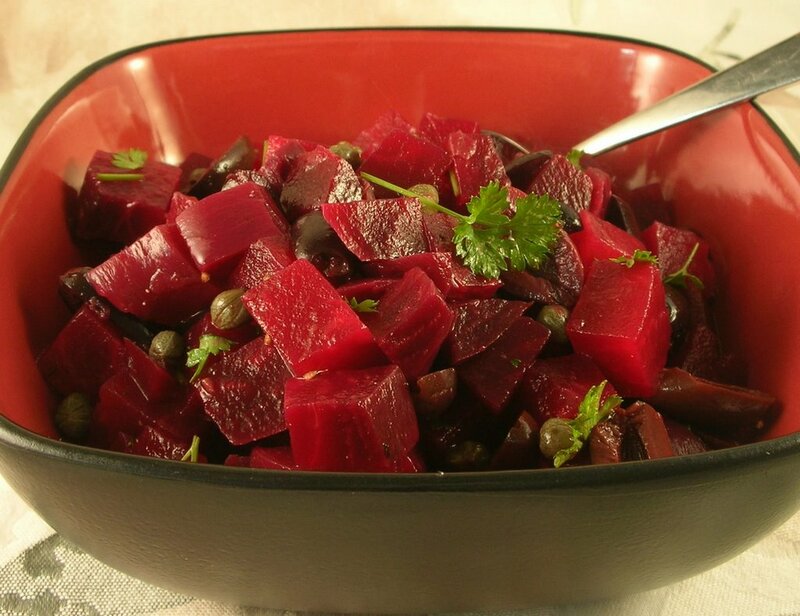 Today's beet salad recipe: A simple beet salad, just cooked beets tossed with a little lemon juice and olives. A great contrast to rich vegetable dishes, spare and earthy. This beet salad would be a great addition to a Thanksgiving table. Unlike so many Thanksgiving vegetables, it's not sugary, it's not creamy, it's not soft(y). And it requires no cooking or prepping on the Big Day! Plus, beets add lovely color. Just don't think about roasting or cooking the beets at the last minute for the cooking time varies way too much. The good news is that beets can be roasted or cooked two or three or even four days before, then used in delicious cold salads. Combine all ingredients except the parsley. Just before serving, stir in the parsley. Serve at room temperature. Thanksgiving or no thanksgiving, I+m going to make it anyway! Thanks! Ding ding ding ding! Oh!!! This one must be on my table this year. How do you think it would be with canned beets? I know fresh are better but it would be a worthwhile shortcut this week if you think it would work okay. Ilva ~ You'll be, ahem, thankful you did! Erika ~ Hmmm ... no, definitely roast the beets, it only takes 5 min of hand-on time, at least to me that would be very worth the effort. Canned beets (which I do like) are just dense, a little acrid. These need to be toothsome, with texture, but not dense. I'm so glad you like this idea, I thought it was really special, if only because it felt like such a contrast to the other creamy-rich-nutty-buttery-sugary vegetables. Another lovely-looking addition to my beetroot recipe repertoire! Great Combination of Flavors. Since you already have olives and lemon juice, I would go ahead and add feta cheese, olive oil and a little pickled hot pepper of choice. I would favor fresh oregano or marjoram over parsley.